Sat., Feb. 9, 2019, 11:41 p.m.
MELBOURNE, Australia – Robert Whittaker provided most of the early drama at UFC 234 in Australia and Israel Adesanya quite a lot at the end. About eight hours before their scheduled fight, Australia’s UFC middleweight champion Whittaker withdrew from his championship defense against Kelvin Gastelum because of a serious abdominal injury and subsequent emergency surgery due to a perforated hernia. That moved up the highly anticipated No. 1 contender match between rising New Zealand star Adesanya and Brazilian veteran Anderson Silva (34-9) to the main event on the sold-out Rod Laver Arena card. 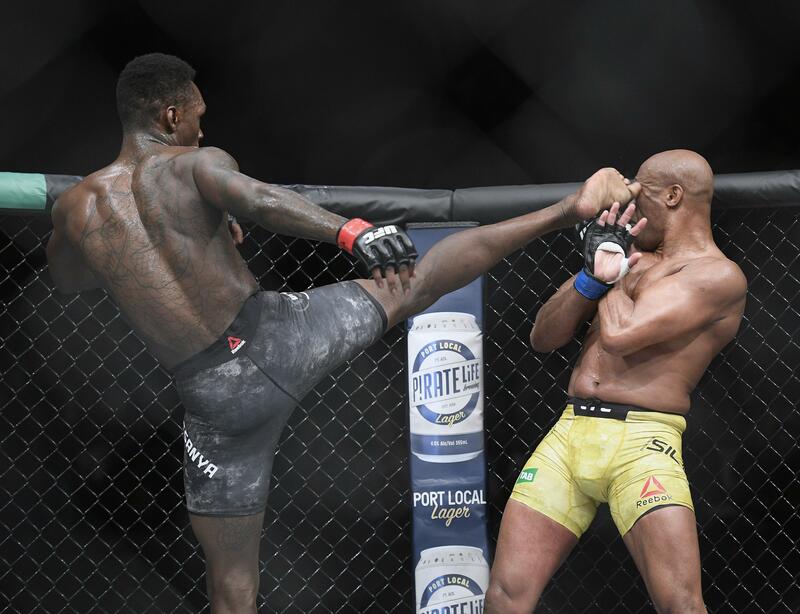 In an evenly matched fight over the first two rounds, Adesanya landed the first blow – an outside kick to Silva’s leg – then followed it up with a kick to his opponent’s right thigh, but Silva fought back with two shots to Adesanya’s chin. Despite the late flurry, Adesanya appeared to have marginally taken the first round. Silva appeared to have won the second round, and chants for the Brazilian went up in the crowd to start the third and final round. But Adesanya, now 16-0, dominated the third for a unanimous decision, 29-28, 30-27, 30-27 as per the judges’ cards. “I’m very happy, guys. Thank you God, for giving me one more chance to come here and do my best. I love my job,” Silva said at ringside during the presentations. The Nigerian-born Adesanya, 29, is considered one of the UFC’s most high-profile title contenders , with a spectacular fighting style that reminds many of the 43-year-old Silva in his prime. Also elevated on the card was the lightweight bout between American Lando Vannata and Brazilian Marcos Mariano, which Vannata won by submission near the end of the first round. Vannata improved to 10-3, two by no contest, while Mariano fell to 6-5. UFC president Dana White said the 28-year-old New Zealand-born Whittaker, who has a record of 20-4, became ill Saturday night and complained of pain in his abdomen before being diagnosed at a hospital with a hernia. White said Whittaker could have died if he went into the ring with such an injury. Whittaker’s manager Titus Day said Whittaker first reported some issues around 6 p.m. on Saturday. “Rob said he was a bit bloated and a little bit tired which is not uncommon when you are going through the process they are going through, reloading and putting some food back in your body,” Day told Australian Associated Press. Gastelum tweeted with “much sorrow” that the fight was off. Tickets for the 15,000-seat arena sold out in eight minutes. UFC has offered full refunds due to the cancellation of the main bout. It marks the second time Whittaker has been forced to withdraw from a scheduled title fight in Australia. Injuries kept him from fighting Luke Rockhold at UFC 221 in Perth last year. Earlier this week, White had said the winners of the Whittaker-Gastelum and Adesanya-Silva fights would meet later this year. Published: Feb. 9, 2019, 11:41 p.m.